Welcome to the Inky Friends Love It - Live It - Share It Blog Hop. We are a group of Stampin' Up! Demonstrators who have gathered to introduce you to products from the 2018 Occasions Catalog. 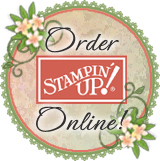 To see the line up of Stampin' Up! artists participating in the hop, click here. If you are traveling forward through the hop, you've arrived from Tanya's blog where she featured projects using the Waterfront stamp set. If you are traveling backwards through the hop, you just saw some great projects made by Mary using the Picture Perfect Birthday stamp set. It really doesn't matter which way you travel through the blog hop, though; all the blogs are linked in a circle and eventually you'll visit all the stops by clicking on the NEXT or PREVIOUS buttons contained in every blog post. I hope you enjoy your travels! I have three projects to share with you featuring the Truly Tailored stamp set and the coordinating Tailored Tag punch. I love the True Gentleman Suite of products and had some fun making these projects. My first project uses the Truly Tailored stamp set, the coordinating Tailored Tag punch, and the True Gentleman Designer Series Paper with a very simply card design that showcases the wonderful color coordination found in every package of Stampin' Up! Designer Series Paper. This second project reminds me of time spent with my Dad while he was in woodworking mode. This card features a background created by piecing papers from the Wood Textures Designer Series Paper Stack punched using the Tailored Tag punch. My father would have been tickled that I remembered to have all the wood grains going in the same direction. The greeting is heat embossed with Copper Stampin' Emboss Powder. My final project is a gift bag created using the Gift Bag Punch Board (size Small) and a sheet of paper from the True Gentleman Designer Series Paper. The fold-over tag is anchored by the ribbon closure for the gift bag. I'll be back soon with the details for making these projects -- including the liners and envelopes for the cards and the how-to's for the fold-over tag for the gift bag -- so please plan to return for another visit. To visit the next stop on the hop, click the NEXT button to visit with Mary and projects made with the Picture Perfect Birthday stamp set or the PREVIOUS button to visit with Tanya for projects made using the Waterfront stamp set. Mickey, what a wonderful set of projects showcasing this stamp set. Beautifully done. I think the second card is my fav. Embossed with that copper really makes it a rich looking card. Great work! Very nice. I love all your projects. Love the embossed with copper great masculine card. I love this masculine suite and coordinating paper. The little gift bag is perfect! I wasn't sure I needed the Tailored Tag Punch until I saw your wood textured card! That's just fabulous. I really love how you did the foldover tag too. I haven't ever seen it done like that. That's the perfect bag topper. Fun projects. I love them all! These look great! I am even more attracted to this suite of products. Fun projects! I LOVE the card with the background of Wood Textures DSP punched with the Tailored Tag punch! Seriously LOVE the way you used the different DSP in these cards! Your cards are fantastic! I love the wood DSP one the best but that bag is fabulous! Such handsome cards and projects!! Masculine and marvelous!